Karen has been hard at work creating videos for Sheltie clubs and the family. Here is what she has worked on, posted on You Tube as well as the websites she has created the videos for. If you look, you will see some of the family dogs in the educational videos. 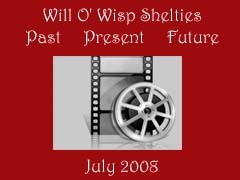 This was the first video done by Karen Peak who is Will O'Wisp's webmaster and webmaster for three Sheltie Clubs.